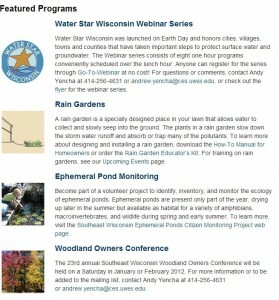 Click here to be redirected to the SE WI Natural Resources! UW-Extension partners with the Department of Natural Resource to deliver high impact, localized educational programming in Southeastern WI related to a host of natural resources including river basin and watershed education. To learn more about program topics and dates, please contact Andy Yencha at the information below. 9501 W. Watertown Plank Rd.